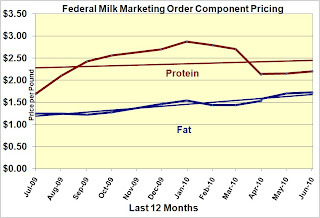 June Component prices showed futher improvement with butterfat, protein and Class III prices all advancing. 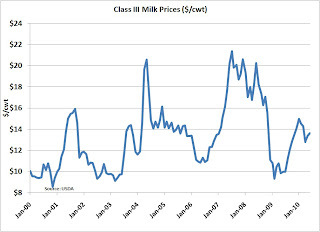 While the increases were small, they were all positive and some of the underlying fundamentals also showed improvement. 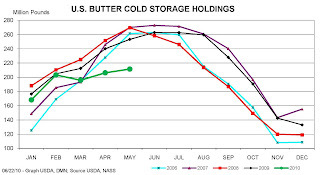 The shorter term movements are highlighted below in the most recent 12 months charts. 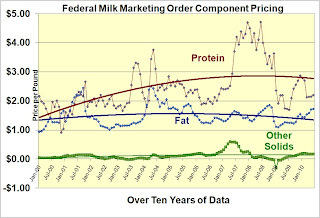 Butterfat has seen a very nice and steady increase and while protein has fallen below the trends recently, the direction is still upward with some improving fundamentals which will be discussed below. As discussed in previous posts to this blog, cheese prices are the most important parameter for protein prices and Class III pricing. 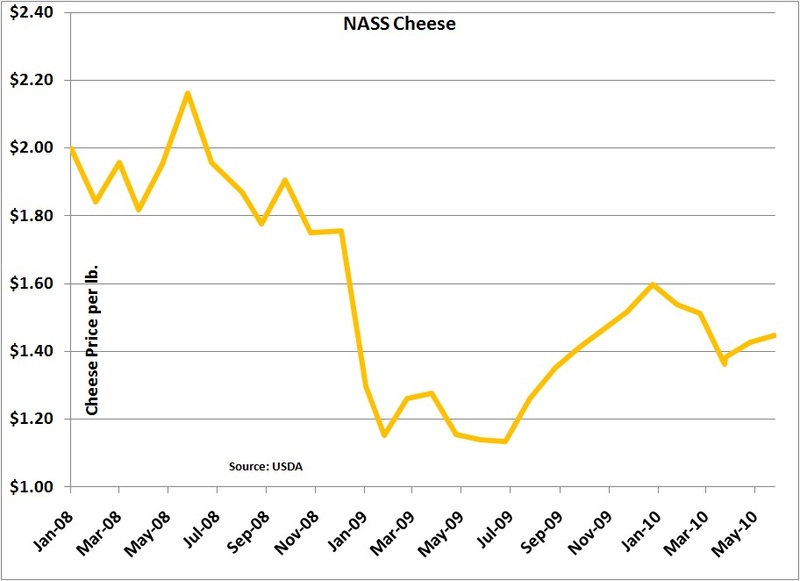 As can be seen below, cheese prices as reported by the NASS survey continued to improve in June. 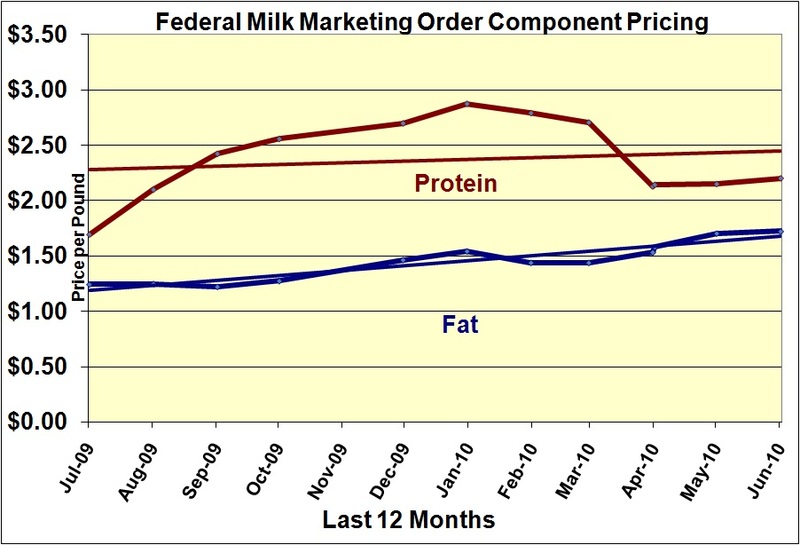 Butterfat and protein prices are unusually close, currently. 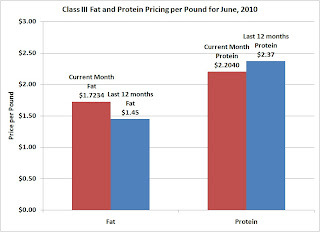 As the chart below shows, butterfat prices are higher than the last 12 month average while protein prices are below the last 12 months average. 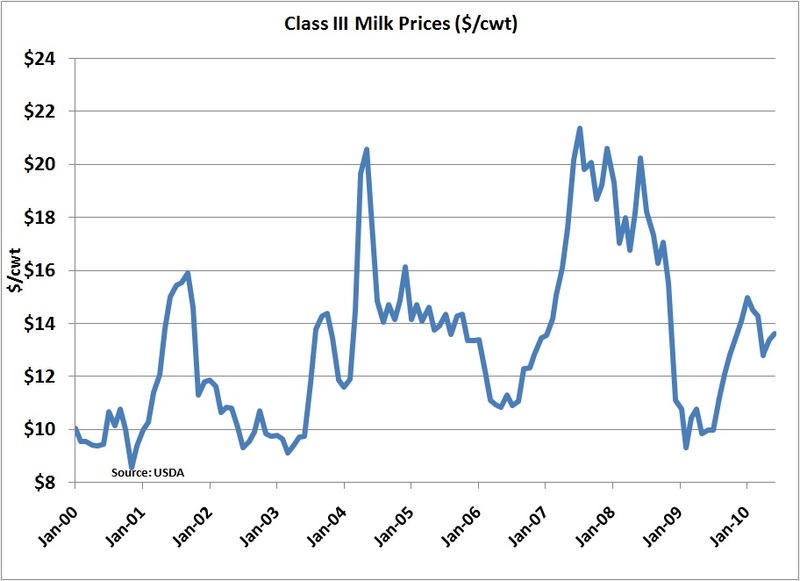 The reason for this abnormality have eveything to do with supply and demand. 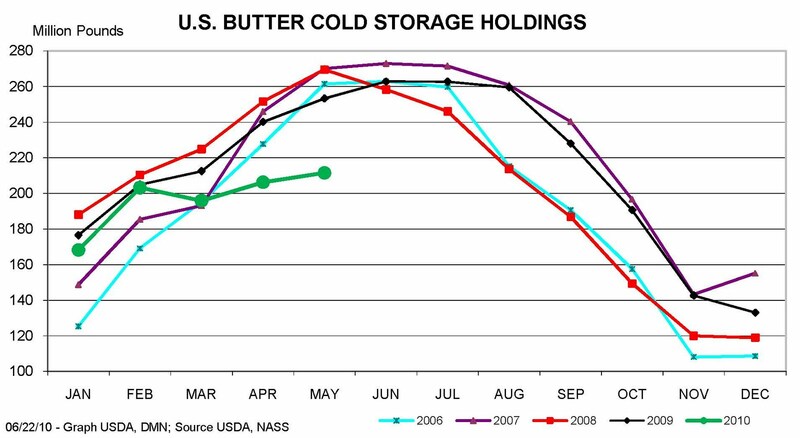 Demand for butterfat has been high and supplies are tight. 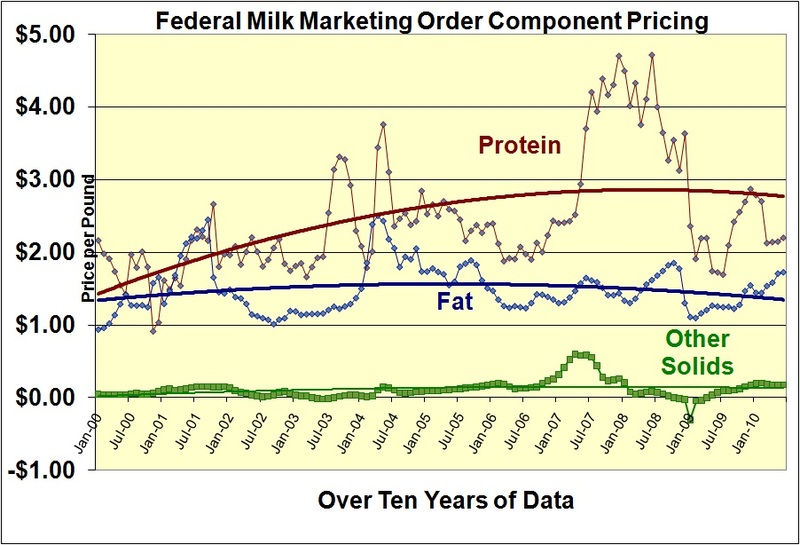 Therefore butterfat prices are high. 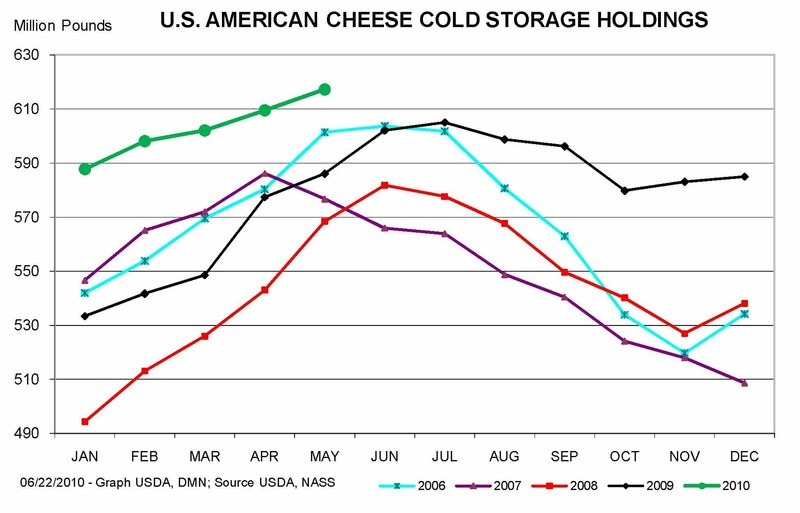 Cheese inventories have been extremely high and are only now coming back into more historical supply levels. 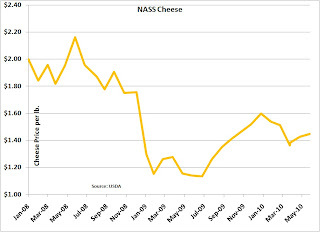 While production of cheese has remained high, demand and exports have reduced supply. Yes, the inventory levels are at historical highs, but considering the annual cyclical flucuations, the current level appears to be an improvement from prior months. The impact of exchange rates and imports and exports will be reviewed in the next post to this blog. 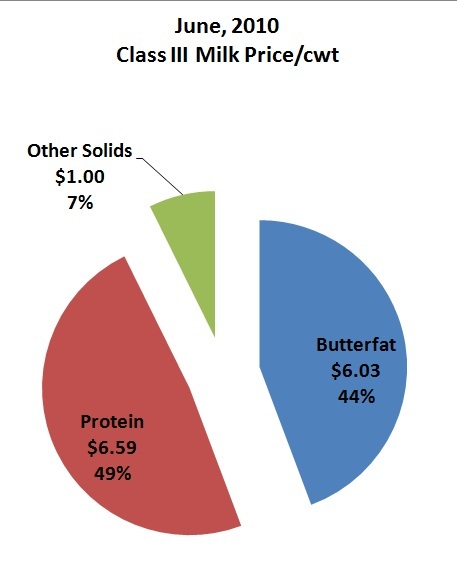 Below is the pie chart of the milk check. Protein at 49% of the check remains the most important parameter in maximizing milk revenue. 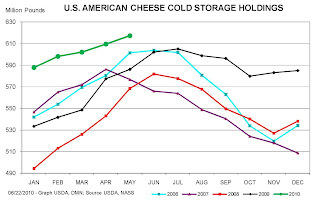 In the next few posts, we'll re-examine the fundamentals of cow inventories, heifers, butter and cheese exports, imports, exchange rates, and look at how our international competitores are doing.